This article first appeared in Personal Wealth, The Edge Malaysia Weekly, on August 14, 2017 - August 20, 2017. The biggest mistake investors make when growing their wealth is looking only for returns. 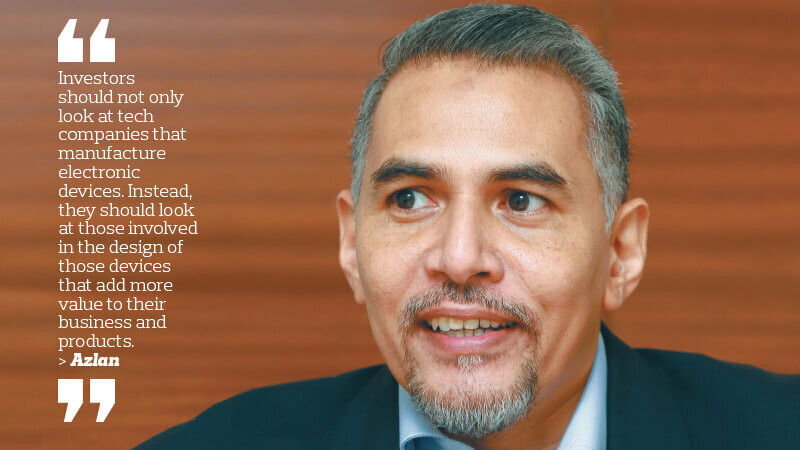 Instead, they should remember that it is also about capital preservation and risk management, says Azlan Hussin, CEO of MIDF Amanah Asset Management Bhd. It is this investment philosophy that guided him during the 1997/98 Asian financial crisis, when he made a contrarian call to aggressively pull his clients’ funds from the plunging local equity market. In doing so, he successfully preserved a huge amount of investors’ money. “Back then, we were holding more equities than fixed income and all the equity fund managers were fully invested, having allocated 70% to 90% of investors’ money to the market. However, when the crisis came, I took a very aggressive position to bring down the equity allocation of our funds from 90% to 30%,” says Azlan. At the time, he was portfolio manager for institutional investors and government-linked companies at SBB Asset Management. He says the investment team had come to a consensus to hold mostly cash. That was a courageous move. Under normal circumstances, equity fund managers would only pare down their investments to 70% at the most as anything more could cause their investment performance to deviate widely from the benchmark indices they track, he explains. The Kuala Lumpur Composite Index (KLCI) continued to decline to 800 points in August 1997 from about 1,200 points five months earlier. But many fund managers did not pull their money from the market because they were worried about being left behind when the market recovered. “There were many signs that showed the market would go down further, but many fund managers still held on in the hope that the market would rebound and they would not be left behind if that happened,” says Azlan. In August 1998, the KLCI continued to fall and hit rock bottom at 260 points. This showed that he had made the right decision. “That was the best call I have made in my life. The KLCI fell about 80% from peak to trough, but our clients only experienced less than 5% erosion in capital,” he says. A crucial part of capital preservation is cutting one’s losses when stock prices fall below a certain level. This, of course, is easier said than done as it requires strong discipline, says Azlan, based on his own experience. While he had successfully cut his losses during the Asian financial crisis, he failed to do so in 2014 and 2015 when oil prices plunged from above US$100 a barrel to below US$40. Instead, he continued to hold on to some of the oil and gas counters, only to see their prices tank. “What we should have done was cut our losses when prices came down. But we found it hard to do so because holding on to those stocks was initially the right call [before oil prices started to decline in 2014]. This is a common mistake many fund managers make. Discipline is hard to apply,” says Azlan. Following the event, he implemented new measures in MIDF Amanah’s investing guidelines to avoid repeating the same mistake. It is now a requirement for the firm’s fund managers to cut their losses when the price of the stocks held by the fund house fall below 20%. “It is easier this way. There have been cases where fund managers and analysts come to you and say, ‘Look, these stocks have prospects despite their prices falling a lot.’ So, we put a hard call on this. This move will be implemented unless fund managers have a strong justification or if our clients ask us not to take losses,” says Azlan. Another key to capital preservation is maintaining discipline when taking profit. This is ingrained in Azlan’s personality as he has adhered to this principle for years. He attributes this to his investment experience, having seen the peaks and troughs of the markets over the years, from the Asian financial crisis to the dotcom bust to the 2008 global financial crisis. “I have gone through a full market cycle, the ups and downs of it. And this humbling experience helped build my character and career into what it is today. If you have a target of 15% return to meet, you take profit at that point and meet the target,” he says. For instance, Azlan invested in two local companies — Unisem Bhd and Malaysian Pacific Industries Bhd (MPI) — in 2000. Their share prices had rallied as they were riding the technology investment theme that investors were betting on at the time. Then, the dotcom bubble started to burst. However, he managed to take cover as he had taken profit when he met his target return. But some fund managers and investors were badly burnt when things took a turn for the worse. “I am a bit more conservative than other fund managers. This is probably my weakness as well because when the market rallies, I may not get the full market performance. I have to say that I am not a momentum trader, but more of a long-term buy-and-hold fund manager,” says Azlan. He adds that the fund house has an investment view of 18 to 24 months. That is why he always tells clients to stick to MIDF Amanah’s funds for at least three years to see their investment bear fruit. “Investors usually look at the short-term performance. But I always tell them to take a longer view, especially in the equity market. If not, you are just riding the volatility and not making any returns by timing the market,” says Azlan. MIDF Amanah currently has four retail equity funds, all of which are invested in the local market. The firm’s best performing fund is the MIDF Amanah Islamic, which had generated a return of 17.89% over three years as at June 30. Its MIDF Amanah Growth, MIDF Amanah Strategic and MIDF Amanah Dynamic funds saw returns of 16.97%, 14.74% and 11.04% respectively during the period. Under Azlan’s leadership, the fund house has seen its assets under management grow to RM4.1 billion from less than RM300 million four years ago. Azlan is relatively optimistic about the investing environment this year because the key risk events he had been following closely in the first half of the year, such as the UK and French general elections, have dissipated. A new UK government could have disrupted the Brexit negotiation process while the French election could have seen a right-wing, anti-establishment leader come to power and threaten the existence of the EU. Also, US President Donald Trump has toned down his anti-trade and anti-globalisation rhetoric. So far, he has not waged a trade war with China nor built a great wall between the US and Mexico. “In fact, US stock markets have rallied as people believe Trump will do everything he can to ensure that the economy does well because he is a businessman himself,” says Azlan. On top of that, global markets have been getting used to news related to terrorist attacks and market volatility remains low. “Before the Sept 11 incident, there weren’t many terrorist attacks. And when an attack happened, there was a lot of volatility in the markets. But today, terrorist attacks have less impact on the market. Sadly, this is because people are getting used to it,” says Azlan. An ongoing risk is the prospect of the US Federal Reserve hiking interest rates too quickly and catching the markets off guard. “If the Fed raises rates too quickly and sharply, it could hamper global growth. Global growth recovered strongly in the first half of the year mainly due to improvements in the developed markets such as the US, Europe and Japan. If it turns south due to a faster-than-expected rate hike, it is a risk,” he says. The rising geopolitical risk caused by tensions between North Korea and the US is another thing Azlan is looking at. Last month, North Korea launched an intercontinental ballistic missile to demonstrate its ability to launch an attack on the US. This has escalated the tensions between the two countries. “It could be a black swan event,” he says. All in all, the relatively stable global economic outlook for the rest of the year bodes well for investors in the local equity market as it still has room to grow, says Azlan, who projects that the FBM KLCI will hit 1,830 points by year end. The benchmark index stood at 1,763.34 points on July 25. Meanwhile, the ringgit is expected to strengthen to 4.20 against the US dollar. It was trading at 4.30 against the greenback on July 25. Azlan says the local currency could improve as foreign funds continue to flow back into Malaysian market, given the country’s economic growth forecast of 4.8% by the International Monetary Fund. This will cause the ringgit to strengthen and create a positive cycle. “The ringgit has strengthened by about 5% this year and it is mainly due to the weakening US dollar. The local currency still has room to strengthen as foreign funds continue to flow in,” he says, adding that today’s foreign inflows are only a third of what they were three years ago. A risk on the home front is the possibility of Bank Negara Malaysia raising the overnight policy rate this year, following in the footsteps of other central banks, due to the high domestic inflation rate. This could increase the cost of borrowing and have implications on businesses and consumption. However, MIDF Amanah does not anticipate Bank Negara hiking the OPR this year. “While the inflation rate is high, it is mainly a cost push instead of people really going out to buy stuff. You can see restaurants are not full and wages have not increased by much,” says Azlan. Moving forward, he expects the stocks of companies in the technology and logistics sectors to perform despite their high price-earnings ratio. As at May 22, semiconductor stocks had risen more than 30% since the beginning of this year, according to The Edge. The rally was based on the growth of global semiconductor sales, which caused the average PER of the sector to rise to the high end of the spectrum at 20 times. As at July 27, the PERs of notable semiconductor companies such as Globetronics Technology Bhd, Inari Amertron Bhd and ViTrox Corp Bhd stood at 62.63, 24.47 and 31.52 times respectively, according to Bloomberg. Meanwhile, the valuations of logistic companies remain high as well, fuelled by the e-commerce trend and announcement of the new digital free trade zone by Jack Ma in March. The PERs of notable logistic companies GD Express Carrier Bhd (GDEX) and Pos Malaysia Bhd went up as high as 99.28 and 39.98 times respectively as at July 27. “Yes, valuations have gone up a lot. But this is one of the mistakes investors always make. They tend to focus too much on valuations [but not look at the growth potential of the companies]. You might say the PER of tech stocks and logistic companies such as GDEX are too high. But you should look at PER growth, instead of just the PER itself,” says Azlan, who was one of the earliest fund managers to venture into the tech sector in the late 1990s. He says the tech sector is expected to be fuelled by the Internet of Things (IoT) as more devices will be manufactured and installed in all sectors. “We think there is still so much more to be improved in terms of technology across the various sectors. There are smart homes that connect home devices using an app. Wearable technology — including smartwatches, fitness trackers and sports watches — are widely used today by people who want to monitor their health and track their progress in relation to their fitness goals, says Azlan. He says the recent introduction of motor insurance detariffication has enabled insurance companies to offer risk-based products that require policyholders to install electronic devices in their vehicles or use wearable tech. “That is where the opportunity lies. But you have to bet on the right company such as Globetronics, which has contributed to the returns of our funds over the years. Azlan says logistic companies will ride the tech and IoT trend moving forward. Some of these companies will benefit from the e-commerce trend that is already happening and is expected to gain more traction in the future. “Mobile payment has started to take off here. This could push the e-commerce industry further and good logistic companies will benefit from it,” he says. Investors have to conduct their due diligence and select stocks wisely to identify the gems, says Azlan. For instance, he and his team identified Globetronics years ago and it remains one of the fund house’s top holdings. “To be a stock picker and value investor, it is the company’s management that remains the key factor. Their financial data can be plucked from the web, but you have to meet the management to know whether they can deliver what they have promised,” he says. “We have been visiting and monitoring Globetronics for the last six years and it has not made any losses, even during the crisis. It is also very dynamic. It used to manufacture hard drives before moving on to design and manufacture censors and other more value-added products. As for sectors to avoid, Azlan singles out oil and gas despite believing that oil prices have bottomed out. “Yes, prices have bottomed out. But we believe the sector’s recovery will take longer. So, why put your money in a sector that will not give you returns? “There are a lot of oil and gas companies still in trouble today. The issue here is these companies expanded when oil prices were US$80 to US$90 a barrel from 2011 to 2014. “This is the same for airline companies. They expanded and bought aircraft when the market was at its peak. But the delivery of the planes only came two to three years later when the sector went down. So, they are stuck. Azlan says investment opportunities lie in the service sector moving forward and less so in the manufacturing sector. “It is right to say that our country is having difficulty finding the next growth driver and we need to find our strength. We did that before during the industrialisation period. It was mainly plantations and agriculture, which is palm oil.